I was walking down that aisle of Berkeley Bowl where they house the British food stuffs, Heinz baked beans and so on, when I spotted some familiar packaging. Red and gold and shiny. I stopped, of course, if only to investigate the “shiny” part. 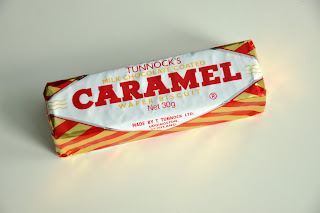 It turned out to be a package of Tunnock's Milk Chocolate Coated Caramel Wafer Biscuits, made in Scotland, and until last week I had completely forgotten they existed. In college I took a semester to study in London, and I was addicted to these crunchy, chewy little treats wrapped in foil. How I forgot about them, I'm not sure—they just got misplaced in my memory. Thanks, Berkeley Bowl--you rock. One of my favorite foodie spots in SF is Miette's Confiserie in Hayes Valley—they sell Miette's macarons and cupcakes, but also a vast assortment of strange candy, fancy (and sometimes expensive) chocolate bars, and just about every variety of licorice you can find. On the table in the window where you walk in, they have sundry small sweet bites, usually pretty cheap, and always changing. Sometimes Italian amaretti, sometimes chocolate caramels—every couple of months there's something new in the selection. 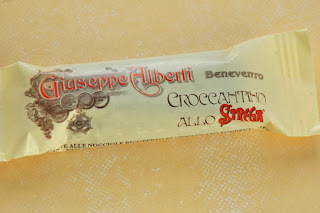 A few weeks ago I found a confection made with the liqueur Strega—and it was very tasty indeed. A layered treat the bottom is a nut croquant (French for “crisp”) with a chocolate covering and a hint of the herbal liqueur. And yea, looks like they're going to stay!